Our secluded 5 ½ acre cabin sits at the top of a mountain. With 3 bedrooms and a finished basement it is perfect for a family or group of friends and cozy enough for two. Use the charcoal grill and eat outside on the deck while enjoying the views and listening to nothing but the birds chirp. If its chilly cozy up to the fire with a good book. The children can run free or play in the playroom. The upstairs loft had a queen bed and a bathroom. The main floor has two bedrooms, one with a queen bed and one with a full…(there is also a tent set up for the children), and a full bathroom, the open area includes a full kitchen, dining area and sitting area with a fireplace. The finished basement has a pull out sofa to accommodate extra guests. We live in Westchester and work in New York City. We have two kids, and as they have gotten older they have school commitments. We used to go to the house every weekend but it is not feasible now, hence why we have opened it up. We feel in love with the area but most of all the house! It is so beautiful and sit on the porch you will not hear another person. It is truly calming and both the adults and the children love it. 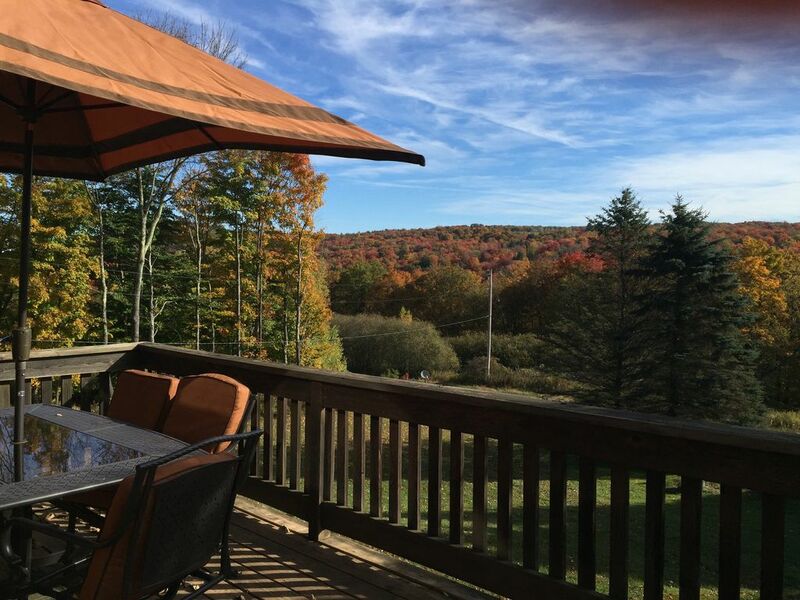 The property is might see a couple of cars meander up the hill the whole day, but we are 5 minutes away from the Beaverkill (fly fisherman's paradise), 20 minutes to Bethel Woods or the new hot casino (and water park to be completed) and 5 minutes to great farm to table restaurants. There is a golf course 10 miles away. Roscoe is trout town USA! We are 5 minutes away from the Beaverkill River, a fisherman's paradise! Thank you Adrian, we are so happy you enjoyed your stay!! Beautiful property, which no longer appears on HomeAway website??? Wanted to give a fair review on a beautiful home in a nice setting, which as of this morning no longer appears on HomeAway...just one more "strange" glitch in the whole Property #828490 rental experience...explanation, please? Hi Barbara, I am sorry for any inconvenience. I spoke to HomeAway. The hid my listing for a day because I did not respond to a rental inquiry in time. I told them I am not actually a hotel, and that I was busy with my children and their activities over last weekend. Everything is unhidden now. I hope you had a nice stay. Nice but would recommend owner leaves more storage space in bathroom. Nice cabin, road to cabin very rough, no air conditioning but cools off at night, plenty of room. Only one television downstairs was a little problem. Main problem was that instructions on how to turn on water should have been left. All in all family really liked it. Very nice accommodations in a well made A-frame cabin. Plenty of room for 4 of us older fishermen. Very close to the prime fishing access. Only drawbacks were many children's toys cluttering and a refrigerator that was already so full we had trouble fitting our stuff in. Owners were very responsive to any inquiries we had. We'll go back again. Leland, I am so sorry you felt it was cluttered with kids toys..I am surprised frankly since they are supposed to be in the corner of the finished basement. We have a meaning lady .. do I need to speak with her? also the fridge..many renters leave their food..this is a good point, I should have her clean it out after every visit. Thank you for your feedback very helpful! We had a wonderful time at the cabin. The first moment you open the door it feels that you walk into your close friend's house. The cabin is equipped with everything you need and more. It is very clean and cozy and has plenty of room for everyone to feel comfortable. The view is amazing and the stars at night are breathtaking. We really enjoyed our stay. Thank you for sharing your cabin with us! Thank you so much Margarita, I am so happy you enjoyed your stay!! Thanks for being a great guest! Great property and great stay! Thank you so much Paul, we hope you decide to return!